Above Pitlochry and Killiecrankie are some wonderful hills to get lost in. The hills are predominantly gently rolling and covered in grass and heather with tracks and paths to ease access. But there's lots in there to catch out the unwary and therefore an ideal location in which to build navigation skills. We also host a similar course in the Pentland Hills, near Edinburgh. An introduction to the navigation skills needed for hiking on the mountains of Scotland. 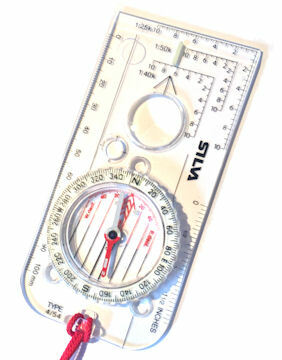 Get to grips with different types of maps and learn how to use a map and compass. Find out what to do when 'lost' and how to work as a 'team'. Have some fun sharing the experience in a small group led by an experienced leader. Explore some Perthshire hills, discovering all is not what first seems ! This event is a guided hiking session, learning navigation skills with one of our experienced and qualified leaders. These events begin with a couple of hours in a 'classroom' in Pitlochry learning theory. After a break, we'll head into the undulating ground around Ben Vrackie for the practical part of the course. Gain the skills needed to navigate on Scotland's hills and mountains. The Perthshire hills around Pitlochry and Killiecrankie are most accessible. There's a bit of everything to be found here, all within a fairly small area which makes for an ideal location in which to learn navigation skills. The session begins with some time in a classroom setting, where amongst many topics we'll be discussing are the different types of maps, understanding topography and learning how to use a compass correctly. We'll then head outdoors and put everything together and practice on the hills. While outside we'll introduce some more important techniques including timing, pacing and relocation. Hopefully we'll work our way onto one of the Perthshire peaks, with Ben Vrackie being the obvious goal, from where our effort will be rewarded with some fine views over the Southern Highlands, the Cairngorms and much more. By the end of the course you'll be able to navigate with confidence on Scotland's mountains ! For the time on the hills you'll need some hiking gear appropriate to the conditions and time of year including a pair of boots or approach shoes. Depending on the forecast a hat, gloves and buff might also be needed. You'll need a stop-watch, map, compass, map case (see recommendations below). We can supply maps and we have some spare kit to lend out - please ask in advance if you need to borrow so we can set aside the gear for you. Emma leads our Navigation Skills events in the Perthshire hills. We'll be based in Pitlochry for the classroom session, then start our practical part of the course from Killiecrankie. With these locations being close to the A9 and with a train station in Pitlochry, there are good publi transport connections to this area.